Sasha Chanoff is a humanitarian worker descended from Jewish great-grandparents who fled the early 20th Century pogroms in Russia and settled in the United States. The story of his courageous and resourcefulgreat-grandmother inspired Sasha to work with refugees in war-torn parts of Africa. And it was there, in the Democratic Republic of Congo, that he faced a life-or-death choice. 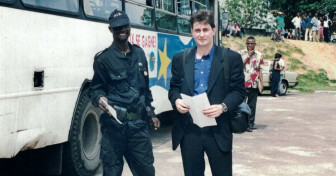 Then, in his mid-20s, Sasha was part of a small rescue team deployed to evacuate 112 Tutsi survivors of a massacre. Strictly no more, as the International Organisation for Migration feared that taking anyone extra would jeopardise the entire mission. But then Sasha and his Muslim colleague Sheikha Ali found 32 widows and orphans who were not part of the quota, all close to death. They knew that these women and children were almost certain to perish if they left them behind – but disobeying instructions and taking them would endanger everyone else on the last evacuation flight. Mike Wooldridge hears what happened next from Sasha himself, two of his colleagues, and survivors of that hazardous mission.